During the week I suddenly had an urge to make lasagna. 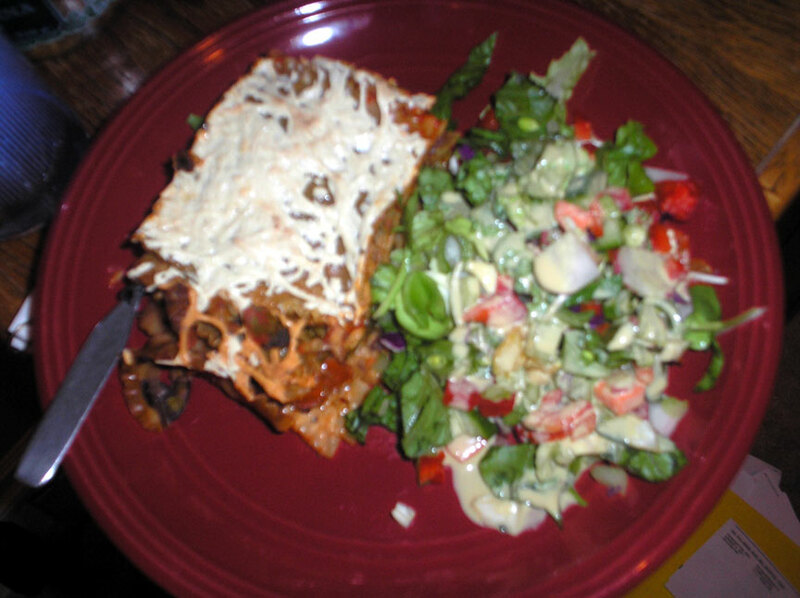 Now, I make lasagna about once every two or three years, if that, so this was a surprise. 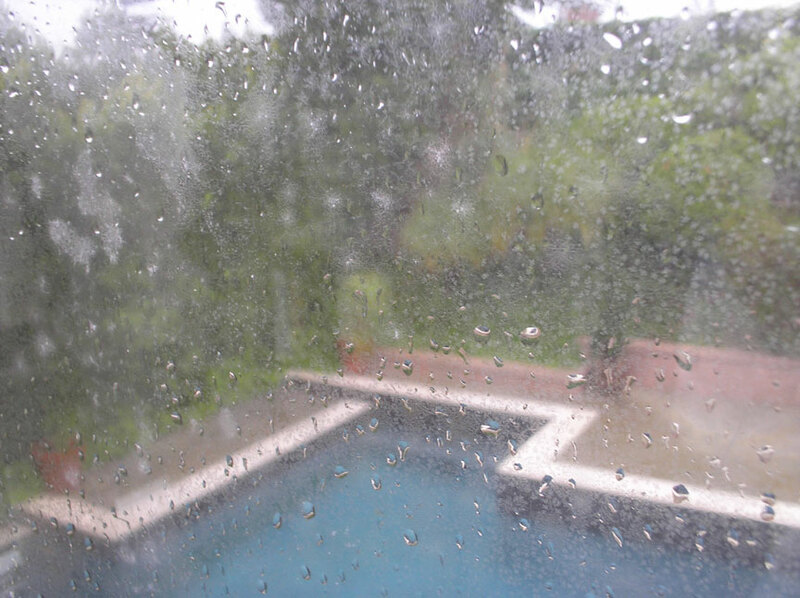 Today turned out to be the perfect day for it, with pouring rain and hail and thunderstorms. 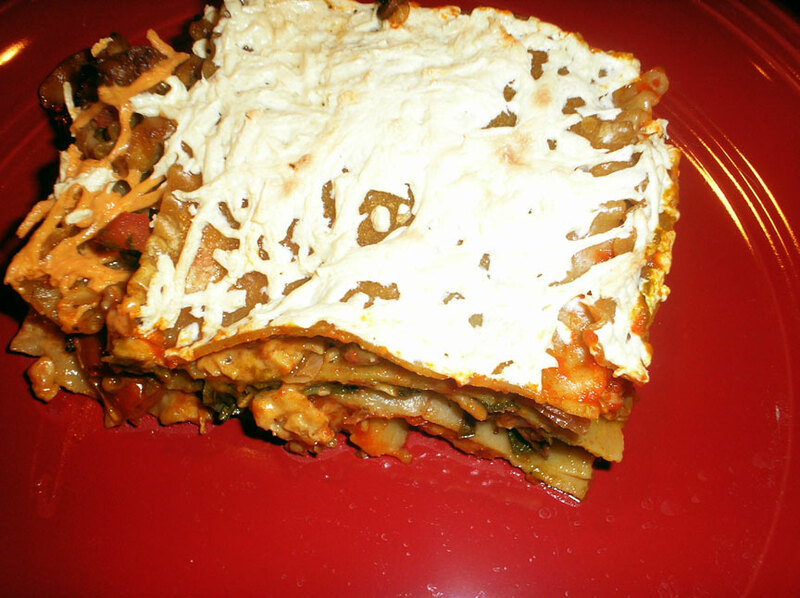 I thought about what kind to make and decided to make it a combination of all the kinds of lasagna I could think of… veggies, a “meaty” substitute, and a great depth of taste with a layering of flavors. An of course, lots of vegan cheese. 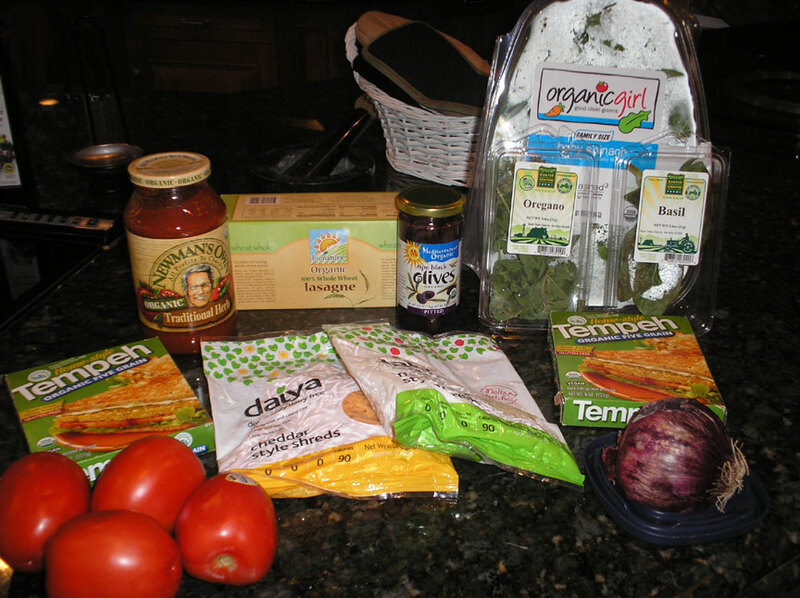 I used 2 of the tomatoes shown, chopped them, and mixed them with chopped olives, fresh oregano and basil. 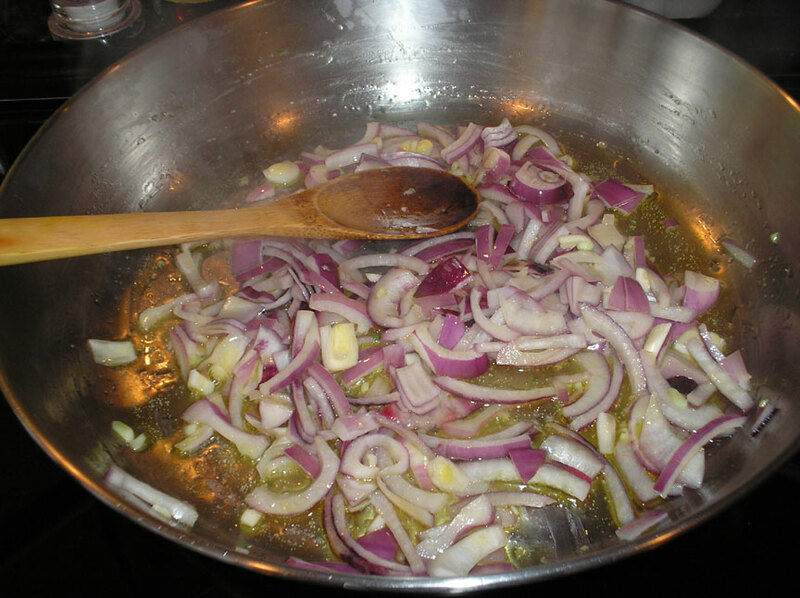 I sauteed sliced onions in a little oil and used a bit of salt to bring out the water from the onions, so only a little oil was needed. 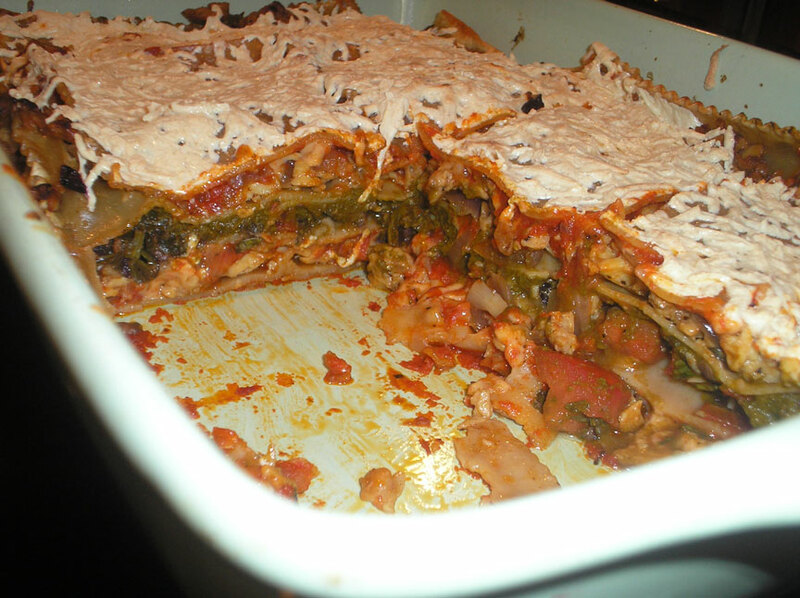 I used tempeh for the “meaty” layer. 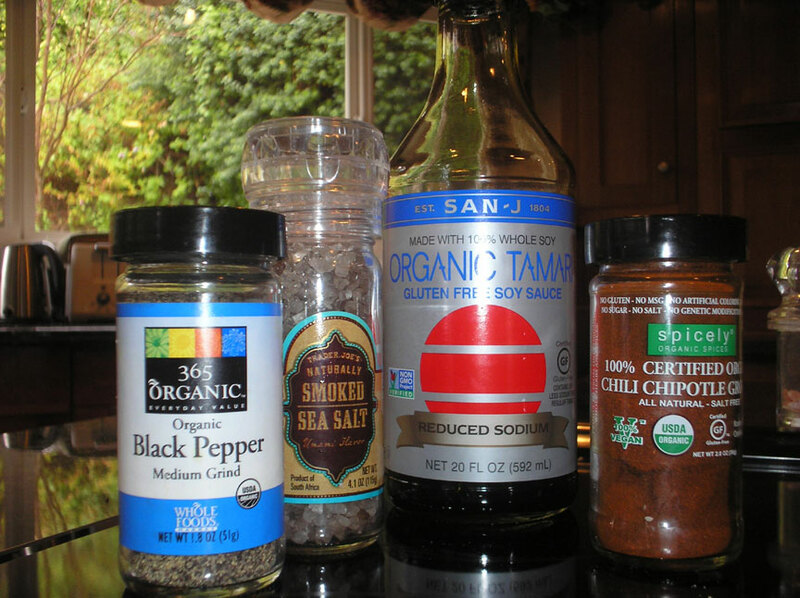 I wanted it to be spicy, so I chose ground chipotle chile pepper, black pepper, smoked sea salt and tamari for the flavorings. I crumbled the tempeh into the pan with the sauteed onions, added the flavorings, and heated it through. I put it off to the side in a bowl, and saw that there was alot of bits of tempeh and seasoning left in the pan. I deglazed the pan with a little balsamic vinegar (watch out for the fumes!) to get all of the bits off the bottom of the pan. I would have used vegetable broth, but had none, so the balsamic was a good substitute. I added about 4 cups of baby spinach to the pan and heated it until it wilted. 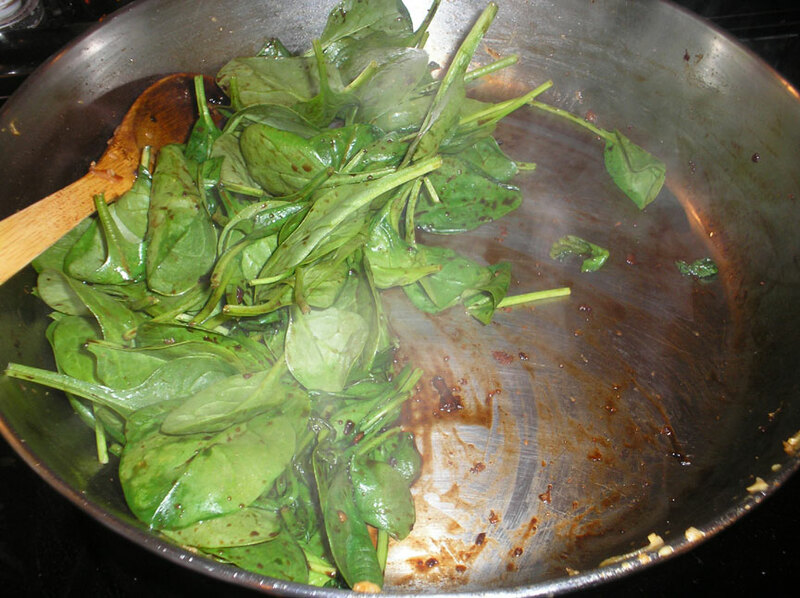 As you can see here, the vinegar did a good job of getting all of the flavor from the pan and mixing it into the spinach. I had some photos of the layering process, but the camera ate them….. I alternated layers to maximize the flavors: noodles, tempeh, tomato/olive/herbs, tomato sauce, vegan cheese / noodles, pesto (that I had in the fridge), spinach / noodles, tempeh, vegan cheese / 2 final noodles and topped with more vegan cheese. Lots of layers, lots of different flavor…. once baked for 45 minutes and broiled for 5 minutes to brown the cheese on top (even though it’s stark white in this photo), it had all melded together. And with some salad and tahini dressing, it was a fabulous dinner! 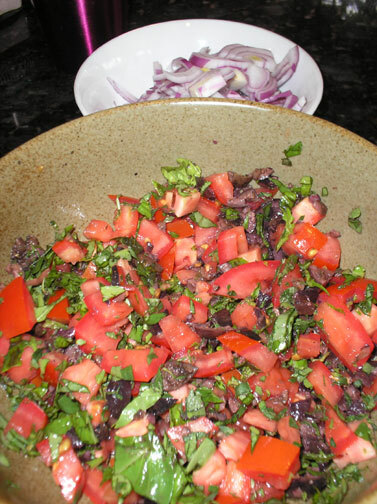 In a small bowl, combine the tomatoes, olives and fresh herbs. Saute the onion and garlic in the oil. Add the tempeh and spices and cook until heated through. Remove the tempeh to a small bowl, and add the balsamic vinegar to the same pan. Cook for a few minutes until the tempeh bits and spices come off the bottom of the pan, then add the spinach and cook until wilted. Preheat the oven to 350 degrees. In a 9×13 baking dish, spread a thin layer of tomato sauce to prevent sticking. Bring a pot of water to a boil and place 4 lasagne noodles in to boil. After 4 minutes, remove the noodles, drain and layer in the bottom of the pan (they will still be al dente). Put 4 more noodles in to boil, and add the first layers of toppings on the first layer of noodles: half of the tempeh, all of the tomato/olive/herb mixture, and 1/2 cup of vegan cheese. Add the second layer of noodles, then top with all of the pesto, all of the spinach and 1/2 cup more of the cheese. Put 4 more noodles in to boil. Add those noodles to the pan, then top with the remaining tempeh. Boil any remaining noodles until al dente, add to the top, and cover with one last layer of vegan cheese. Bake for about 40 minutes, covered, until the top layer of cheese is melted. Uncover and broil for 5 more minutes, until the top begins to brown. Remove from the oven and let set for 10 minutes before serving. Wow Kelli. lucky housemates to eat this!